Legendary pediatric surgeon and former long time Surgeon-in-Chief at Children’s NationalMedicalCenter, Judson G. Randolph, MD, gave the Robert E. Gross lecture at this week’s American Pediatric Surgical Association Annual Meeting. 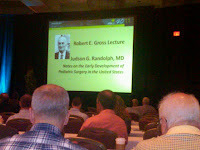 His talk, “Notes on the Early Development of Pediatric Surgery in the United States,” discussed pediatric surgery’s founding fathers, including pioneer, William E. Ladd, MD, long time Surgeon-in-Chief at Harvard who was the first to narrow his practice to the surgical care of infants and children. Dr. Ladd was also a great teacher, and many of his trainees in Boston went on to revolutionize the pediatric surgical field. Chief among his protégés was the lecture’s namesake, Robert E. Gross, MD. As the first to successfully operate on the major vessels near the heart and the person who established the foundation for peripheral vascular surgery, Dr. Gross influenced pediatric surgery, but also cardiology and general surgery as well. He was “saving whole children who had never been saved before,” according to Dr. Randolph. Lucian Leape, MD, who conceived the American Pediatric Surgical Association, and essentially brought the society into being. Judah Folkman, MD, who helped bring the practice of research to the pediatric surgical specialty. Kathryn Anderson, MD, the first woman and first pediatric surgeon elected president of the American College of Surgeons. The core group of innovators and leaders in the early years of pediatric surgery all had ties to Dr. Ladd and Dr. Gross. Their training spread the culture of innovation in pediatric surgery to children’s hospitals around the country. This esteemed list of alumni includes Dr. Randolph himself--Children’s National was one of the first medical centers in the country to offer specialized training in pediatric surgery through its education and training program, which he led during his time here. Later this week, the Institute will award the first-ever Sheikh Zayed Institute Award for Innovation in Pediatric Surgery to the most innovative abstract presented at the APSA Annual Meeting, in support of continued innovation in pediatric surgery practice. Children’s National Medical Center is once again ranked among America’s best pediatric institutions by U.S. News & World Report. This is the first year that the nation’s children’s hospital is featured on the list of elite pediatric specialty care providers in every pediatric subspecialty area included in the survey. Children’s National provides premier pediatric healthcare services in key areas including digestive disorders, orthopaedics, urology, cancer, heart and heart surgery, diabetes and endocrinology, neurology and neurosurgery, respiratory disorders, kidney disease, and neonatology. Children’s National is also a top ranked freestanding children’s hospital in terms of National Institutes of Health funding for pediatric research. A new study published in the May edition of the Journal of Urology is the first direct comparison study between the use of minimally invasive robotic surgery for treatment of vesicouretal reflux and the traditional, open surgical method of reimplantation. The study showed no difference in surgical outcomes between the two methods, but did reveal reduced hospital stays and pain medication requirements for pediatric patients. This research, conducted by Sheikh Zayed Institute principal investigator Craig Peters, MD, with a team at the University of Virginia, provides an early indication that this relatively novel approach poses no additional risks to children than traditional methods, while offering the benefits of minimally invasive surgery—reduced recovery time and less pain—that have been well-documented in the adult population. While the study found that operating time was 12 percent longer when using robotic laparoscopy, the average length of stay following the procedure, as well as the use of pain medication, were significantly reduced for patients who had the robotic minimally invasive procedure. Vesicoureteral reflux is a common condition in children that can put kidneys at risk for damage from infection. Most children can be managed without surgery, but when needed, the traditional open techniques require several days in the hospital, discomfort and a 3 to 4 inch scar. While there are other minimally invasive techniques, their success rates in curing reflux are less and may not last. Open surgery is the gold standard to cure reflux, and the robotic approach offers reduced post-operative morbidity with identical cure rates. Conducting research and development into tools and methods tailored for the unique needs of the pediatric population, including the use of robotic surgery, is a primary goal of the Sheikh Zayed Institute for Pediatric Surgical Innovation. Current robotic technology is applied for children mainly in the area of urological surgical procedures, and Dr. Peters’ bioengineering research explores the possibilities of expanding robotic surgery in children to more applications. Scientists led by Zenaide Quezado, MD, director of the Pain Neurobiology Laboratory of the Sheikh Zayed Institute for Pediatric Surgical Innovation at Children’s National have discovered that resiniferatoxin, a drug that has shown early promise as an option for chronic, severe pain sufferers, may decrease the body’s ability to fight off bacterial infections, particularly sepsis. “Our job as pain medicine researchers is to try and uncover as much about these medications and side effects as possible so that we can monitor and treat those side effects," she said. Resiniferatoxin shows great promise to ease chronic pain by targeting that pain in an entirely new way. The National Institutes of Health are undertaking a series of clinical trials in humans to determine its effectiveness.